There isn't, by definition, much of anything in space. For the most part, it is this emptiness that causes problems for space travel. Lack of oxygen, lack of resources, lack of options for rescue or resupply if any number of things were to go wrong. Radiation, however, is one of the things that there isn't a lack of, and this in turn causes its own problems for anyone looking to live and work in space. Astronauts, either aboard the International Space Station (ISS) or any possible future space travel that takes us even further from our home planet, will have to contend with the problems caused by radiation in space. There is of course a concern about the general health effects of the increased exposure to radiation, and whether it is possible to effectively protect astronauts from this exposure, and thereby extend the boundaries of how far we can safely travel from Earth. In an effort to solve these problems, or at least accumulate more information about the dangers inherent from radiation in space, Mirion Technologies took part in the ESA Active Dosimetry (or EuCPAD (European Crew Personal Active Dosimeter)) program, headed by the European Space Agency (ESA) and with contributions from companies across Europe. Below we'll provide more information on the nature of the problems, the solution that was developed, its results so far, and what it may mean for the future. Natural sources of radiation are generally categorized as being either terrestrial (coming from Earth) or cosmic (originating in space). Terrestrial radiation, usually from the decay of radioactive material in the Earth's crust, is generally in the form of alpha, beta, or gamma radiation, which are generally more well understood than cosmic radiation. Cosmic radiation consists of high energy particles made up of atoms that have had their electrons stripped away by their extremely high velocity. The concern for space travel is, naturally, cosmic radiation. However, it doesn't take space travel for elevation to start making a difference in the amount of radiation exposure that a person may get. 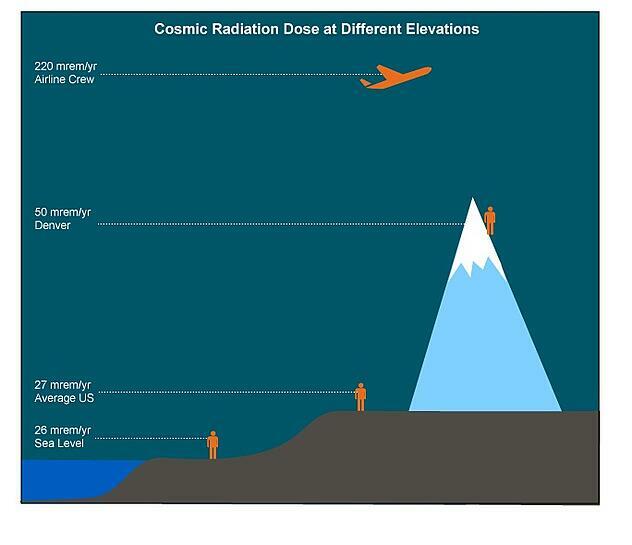 Someone living at a higher altitude, such as Denver, CO, will receive a dose of about 0.5 mSv (50 mrem) from cosmic radiation in a year, contrasted with 0.25 mSv for the average person in the US. The average airline crew member will get an additional 2.2 mSv (220 mrem) in a year. For perspective, the average dose to someone in the US, from all sources, is 3.6 mSv (360) mrem) in a year, so these don't make for major increases, but still notable. 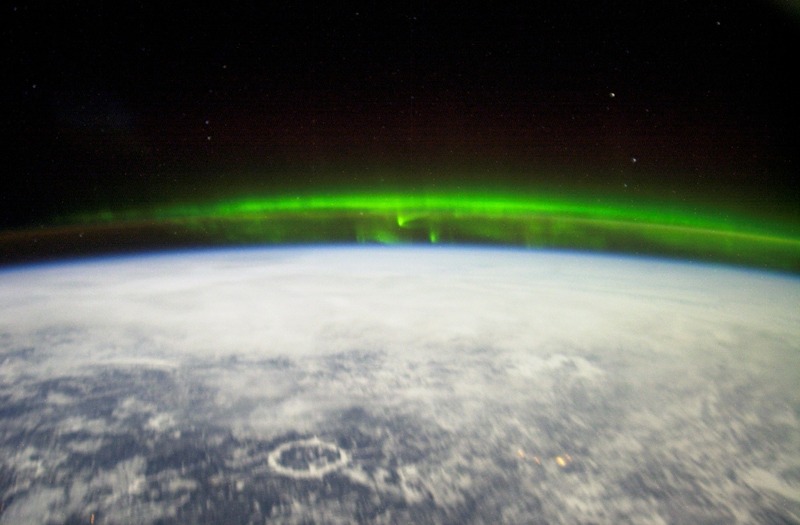 The Earth’s magnetic field diverts cosmic radiation towards the magnetic poles. As the radiation hits the upper atmosphere, the friction causes light to be emitted. This results in oval rings around the North Pole and the South Pole called Aurora Borealis and Aurora Australis, respectively. The Earth, in general, is protected from most cosmic radiation by its magnetic field, which diverts a large portion of the energetic particles travelling through space past the Earth. For astronauts in space, however, there is still an increased risk of exposure. The difficulty inherent in accurately gauging radiation exposure in space has always been compounded by not having a live reading of individual exposure. This is further compounded by the fact that different craft, or even different portions of the ISS, are composed of different materials and thus shield differently from radiation. This makes traditional passive measurements, that need to be read after the fact, even harder to effectively interpret. This information is very important, because based on data gathered by NASA's Curiosity rover, a round trip voyage to Mars and back would involve an increased exposure of 0.6 Sv (66 rem). As it is generally held that a dose of about 1 Sv (100 rem) correlated roughly to a 5% increase in the likelihood of contracting cancer at some point in life, this is obviously a cause for concern for any long-term human space travel. Providing more accurate data on the how and when that radiation exposure occurs is an important first step in determining how to minimize the risks. 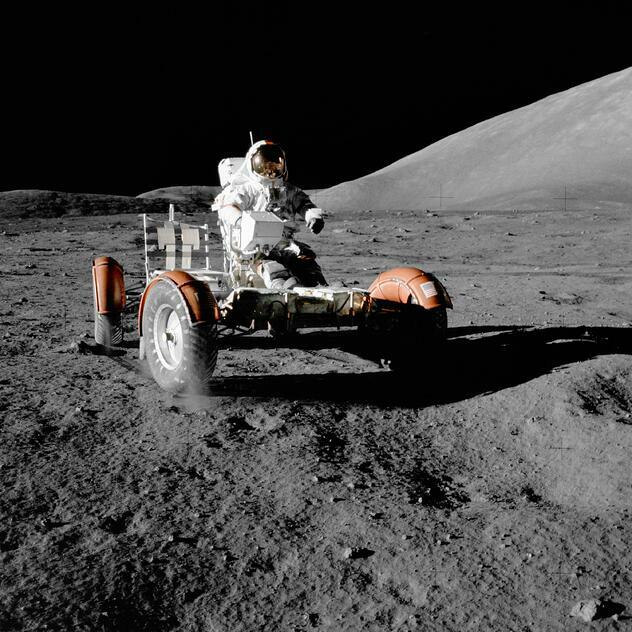 An Apollo 17 astronaut driving the lunar rover on the surface of the Moon. The lunar missions provided some of the earliest information available about radiation exposure on long voyages. For more context, Apollo missions 11-17, in which astronauts landed on the moon, averaged about ten days per mission with an average of 2 days per mission on the surface of the moon. The astronauts on these missions received an average dose of 500 millirad (dose equivalent measures such as Sievert or rem had not been adopted at the time). While still relatively low doses in themselves, they are still much higher than typically seen on Earth. On longer voyages, especially without any effective intelligence on how to minimize exposure, that increased dose accumulation will quickly exceed safe limits. 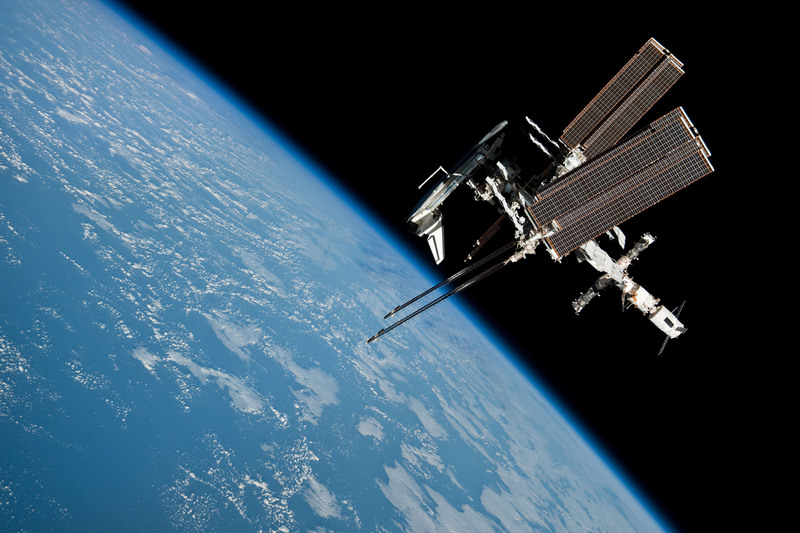 In order to explore a solution to the issue of real-time tracking of radiation dose exposure to astronauts, the European Space Agency started the ESA Active Dosimetry project. 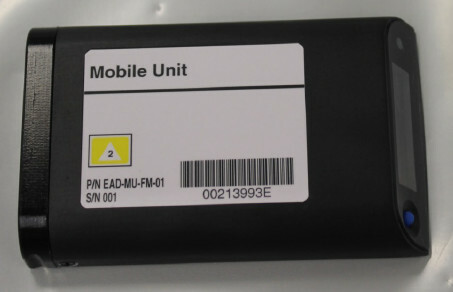 ESA, along with a team of various European companies with expertise in the field of radiation detection, including the Mirion Technologies team in Turku, Finland, was tasked to design and build an electronic dosimeter that would be able to provide a live reading of radiation dose, and be sensitive enough to measure the high-energies of cosmic radiation. The ESA Active Dosimetry Mobile Unit. The developments provided by the consortium delivered the Mobile Unit (MU), a small electronic device to be worn by the astronaut, with four separate detector elements that cover a wide range of energies and a digital readout allowing for live readings by the wearer. One of those detector elements is a direct-ion-storage (DIS) detector provided by Mirion and also found in Mirion's Instadose® dosimeter. This combination of detectors provides the MU with excellent detection sensitivity across a wide range of energies and radiation types, including the high energy cosmic particles which can be hard to test for on Earth outside of some particle accelerators at research labs. The ESA Active Dosimetry Personal Storage Device. Complementing the MU is a Personal Storage Device (PSD), which functions as a charging station and data storage terminal for the MU. This allows data from multiple MUs to be compiled for further analysis and study. In addition to the DIS detector element on the MU, Mirion also provided the manufacturing and assembly of both the MU and PSD, consolidating the contributions from the various companies and teams from across Europe. 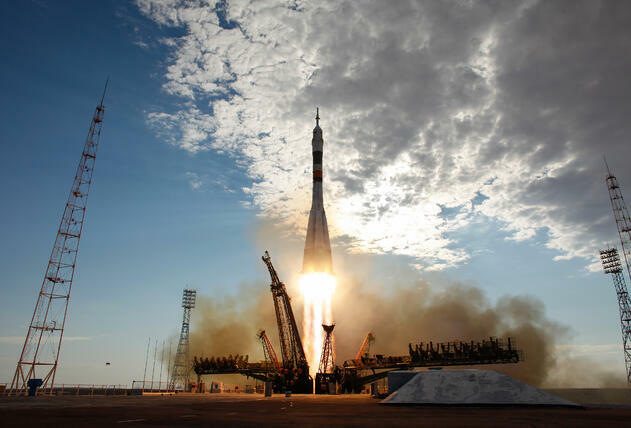 A Soyuz Rocket similar to the one that carried the first ESA Active Dosimetry test units to the ISS lifting off from the Baikonur Cosmodrome in Kazakhstan. In the fall of 2015, the ESA Active Dosimetry system underwent its first real operational test, launching with astronauts from ESA on a Russian Soyuz rocket, and spending time aboard the ISS. 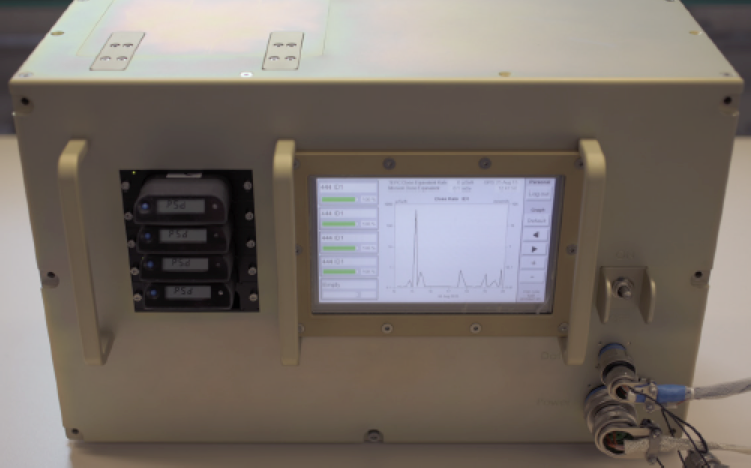 The Mobile Unit measured the radiation exposure from liftoff into space, making the ESA Active Dosimetry system the first ever personnel dosimetry application to measure real time doses in space, and underwent a series of tests aboard the Space Station. 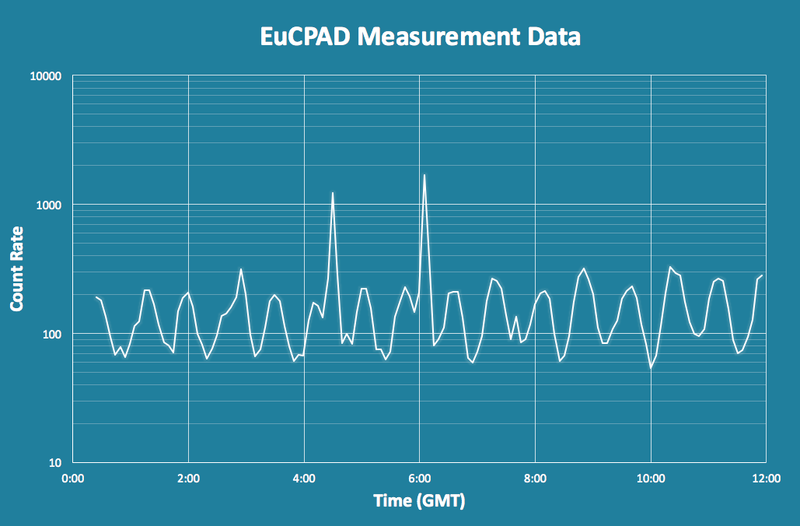 An example of the data recorded by the ESA Active Dosimetry tests aboard the ISS, showing count rate measurements over a twelve hour period. The two large spikes are due to the South Atlantic Anomaly (SAA) crossings of the ISS, an area where particles trapped in the Earth magnetic field are able to penetrate further into the atmosphere rather than be deflected back into space. Further tests are planned for the ESA Active Dosimetry system during European missions to the ISS in 2016 and 2017, hopefully providing a wealth of new information about the radioactive environment in space and how to mitigate the threat of exposure. With increased interest in recent years in space travel and the options available for longer voyages, it may prove to be information of enormous value. Having information about where or when increases in exposure occur can prove instrumental in planning longer missions to space so that the risks from cosmic radiation can be mitigated. Even learning which modules in the International Space Station provide better shielding from different types of radiation can prove helpful in the development of future spacecraft. If humans hope to eventually travel even further than they already have, perhaps to visit Mars or other planets, it is crucial that there be a solution to the problem of protecting astronauts from the harmful effects of radiation in space. Mirion Technologies is happy to have played a part in the search for a solution to this problem. Welcome to the Mirion Technologies radiation safety blog! Here you will find the latest updates in the world of radiation safety, recently released Mirion products, and a wide variety of other resources. We hope that you enjoy it and find it useful.